Ferns broke apart. A small, bird-like figure dashed through the stream of sunlight, black and white bars of a long, scaly tail gleaming for an instant before plunging into a thick tangle of rigid cycad fronds. Branches still swaying, another figure leapt through the beam of light. Larger. Stronger. A flash of claws, and his spotted coat of furry feathers disappeared after the banded tail. He darted through the dense undergrowth, eyes large and luminous in the gloom as he pursued his quarry. She was fast, her three-toed feet light on the soft forest floor, but he followed the long black and white tail that wove in and out of shrubs, over fallen branches, under curling cycad fronds…Always one step ahead, but not for long. A large, fallen tree crossed their path. The smaller creature hesitated for an instant, her creamy head bobbing, birdlike, searching for an escape. Opie pounced. Long arms with grabbing fingers reached forward almost as far as his snapping jaws, but they closed around air. With a startled chirp, the small creature was suddenly high above him. She landed on the rough bark of the fallen tree and scrambled up to the top with clawed hands and feet, the light and dark patches of her feathered body blending in seamlessly with the fragmentary shafts of light that pierced the canopy high above. She stood as tall as her small body could stand and chirped a high, rapidly repeating call, her head twitching back and forth with each squeaky note. A second creamy head appeared at the top of the log. Then another. They looked down at Opie, chirping with the sound of rubber shoes on a polished floor, and more creamy heads materialized in the gloom. Black and white banded tails waved back and forth like a mass of mesmerizing tentacles. Opie took a step back. And then another. Like a horde of writhing serpents, the scaly mass of black and white jumped down from the log, and with a screech Opie turned tail and ran into the forest. The smaller dinosaurs lowered their banded tails, and one by one disappeared into the gloom. Their quiet chirps muted by the chorus of voices in the undergrowth. 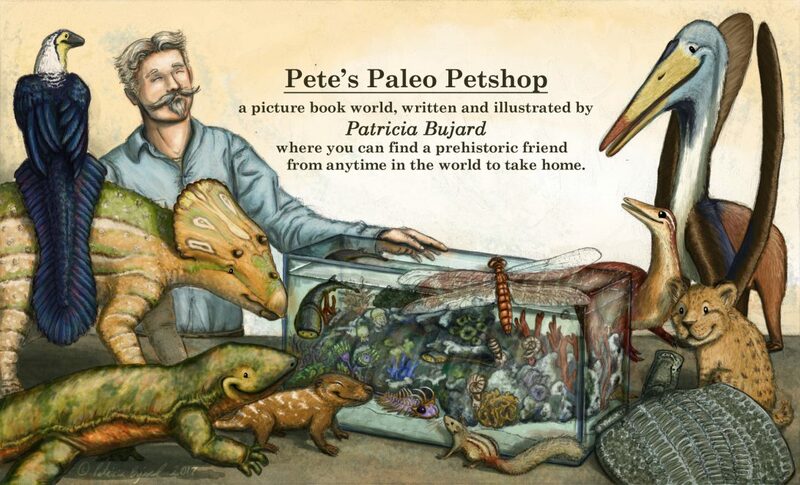 The little dinosaur (about average dog size) Opie chased in this story is Pearl the Othnielosaurus. She hasn’t been featured here in the Shop yet, but she’s had a sketch over on my Instagram. If you’ve seen her there you might’ve noticed I’ve already made a few changes to her appearance. Mostly the fact that her body has feathers like Opie, even if her tail, legs, and little arms are still scaly. Why? Well my super abridged answer is that the feathers are purely speculation, more of a “maybe it looked this way, maybe it didn’t, but I kind of like it” sort of thing. There are some two-legged, plant eating dinosaurs (traditionally called Ornithischia) preserved with fur-like feathers…but they’re only distantly related, so aren’t really helpful in knowing anything for sure about Dryosaurus and Othnielosaurus. Woohoo! So much pretty color! I’m super excited to see this coming together. 😀 This is the base color, so no real details, shadows, or highlights yet. The light and shadows will really bring this scene to life! Why is there a big gap in the middle? That’s called the gutter, and it’s usually lost in the crease between two pages that face each other. It drives me nuts when picture book illustrators don’t seem to take this into account. An otherwise gorgeous illustration is messed up by a great big ugly crease down the center…so the rocks and foliage have matching edges with filler stuff in between. I couldn’t really do that with the cycad branches, so that’s why there’s an actual gap there. There is a little risk that the crease won’t swallow up the entire gap, but I think a tiny bit of blue disappearing into the center crease is better than the ends of the branches disappearing. But wait a minute, aren’t there supposed to be more people in this scene? I took a close look at Disney’s “The Jungle Book”, and how they painted the jungle background for inspiration on how to imply layers of foliage without being too busy. The Disney classic has a simpler, more stylized way of portraying it, but it was good for getting an idea on how to tackle it. Most animation studios *cough*like Disney*cough* have rather stylized characters, and so even characters like Snow White and Wendy, who are based on live action models and are relatively realistic, are not very helpful for my purpose. Pixar’s computer animation wasn’t very helpful either. Luckily, Disney studios has a character that was not intended to be stylized, but was supposed to be an animated little girl. Penny, from “The Rescuers”. Hopefully I’ll be finished with this illustration next month! I’ll have another version without the gap so I can print it out for presentation at the local library. It’ll be awesome to see it all framed. You’d be surprised how much of a difference it makes to see a physical copy of a digital painting. It’s all a little ethereal until you can actually hold it in your hands! I hope Pearl joins the shop this summer with her friends Rosie, Opie, and Steggy. Will you also add in Fruitafossor, Tanycolagreus, and Haplocanthosaurus? Fruitafosser and Haplocanthosaurus have been on my list for a while, and are definitely a priority, but I’ll be sure to add Tanycolagreus to the list too. 🙂 Cool, I had no idea it was part of the Morrison Formation. 🙂 Thank you for all the great suggestions! Anyways, Picasso is next COTM! Just got a question, will Douglas be featured again? He is one of my favorites!